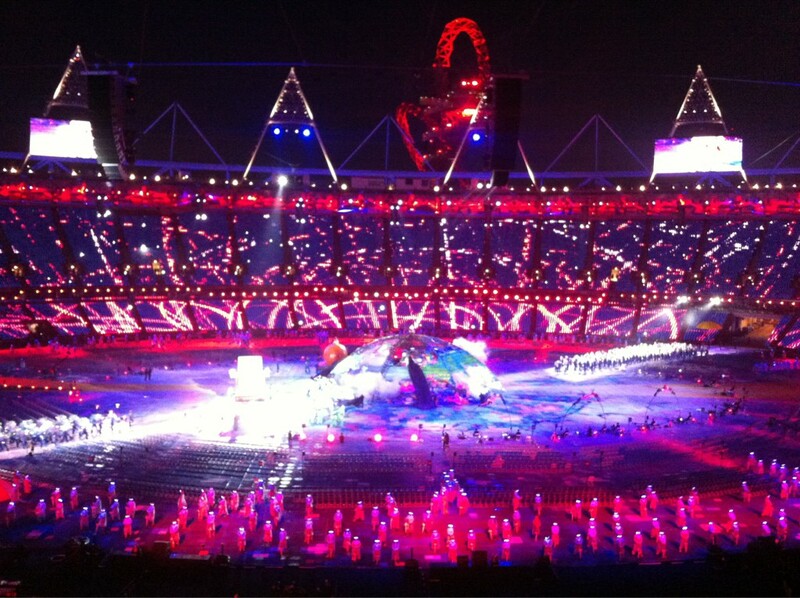 Tonight’s London 2012 Paralympic Opening Ceremony was another spectacular show in London. 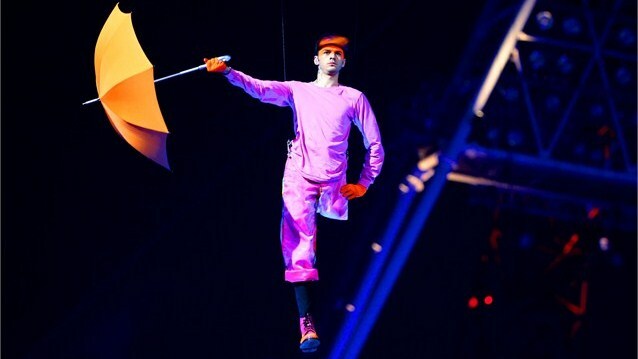 Among the evening’s themes, inclusion, the song “Under my Umbrella” was perfect to start the show. The staging, lighting and choreography were stunning. 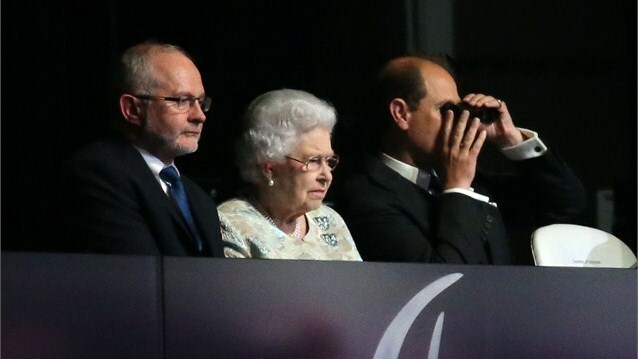 Her Majesty was accompanied by the UK’s Sir Phillip Craven, he is the President of the International Paralympic Committee, on the right you see Prince Edward. 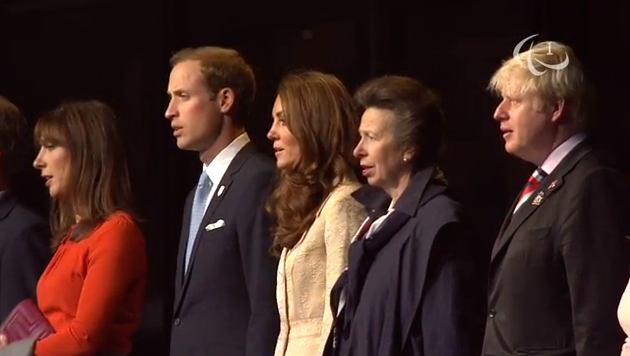 Other in attendance included (left to right) Samantha Cameron, Prince William, Kate, Princess Anne and London Mayor Boris Johnson. 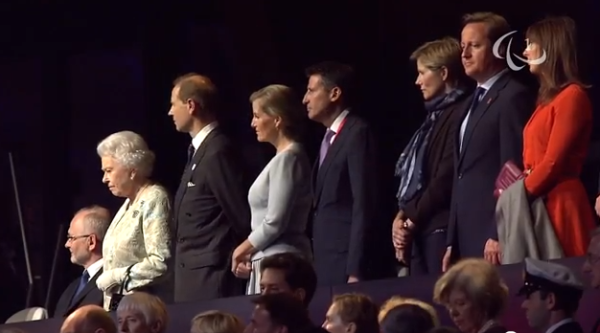 From left to right, Sir Philip, the Queen, Prince Edward, Sophie, Sebastian Coe, Prime Minister David Cameron and his wife, Samantha Cameron. 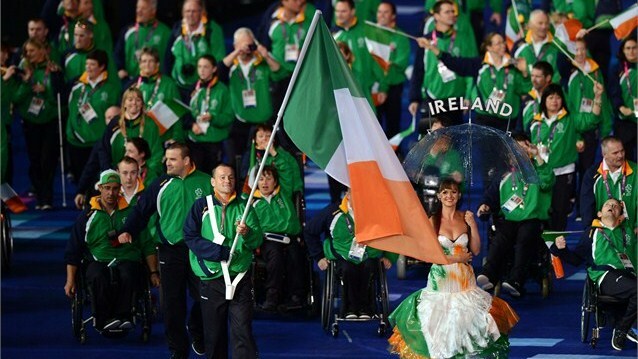 As always, the Parade of Nations was a delight to watch, below, Ireland. 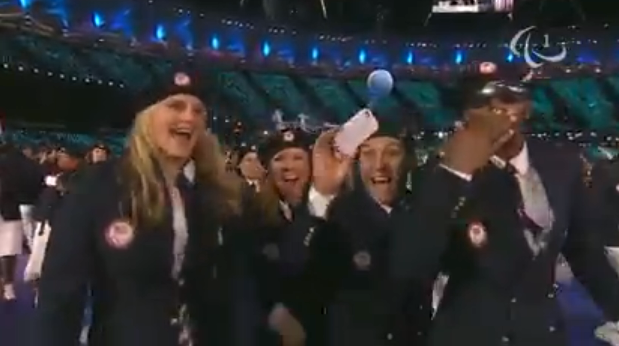 Here we see Team USA. 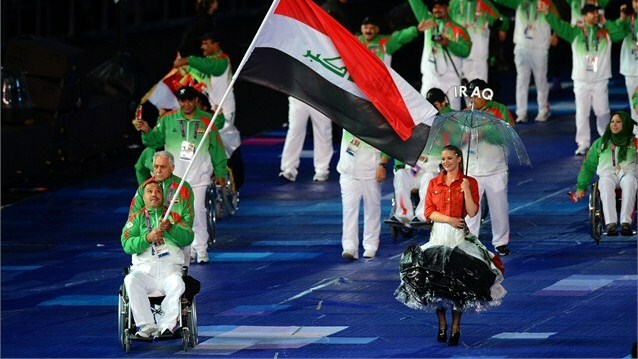 Iraq is shown entering the stadium, the flag is carried by power lifter Faris Al-Ajeeli. 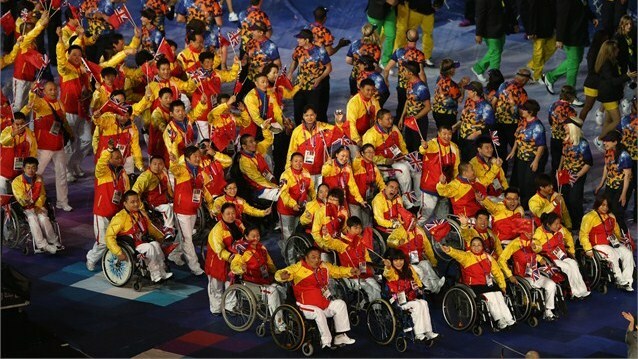 China’s team as they come into the stadium. 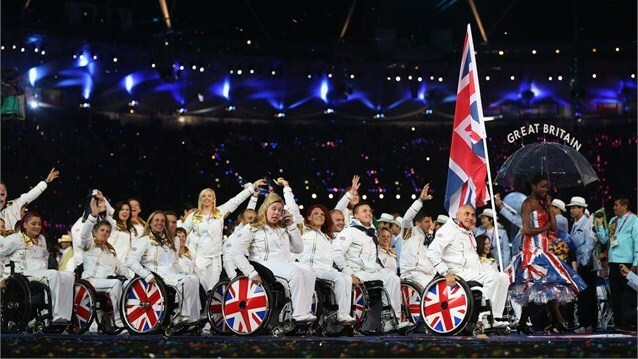 The roar heard when Team GB entered was overwhelming, tennis player Peter Norfolk carried the flag. The Duchess maintained her focus on wearing very low key pieces seen during the Olympic games, bringing back an item worn previously, a coat first seen at the 2006 wedding of Laura Parker Bowles to Harry Lopes at St. Cyriac’s in Wiltshire. It was made by Danish Label DAY Birger et Mikkelsen, Kate repeated the piece in 2010 for the wedding of Mel Nicholson and Oli Baker at St. Andrews, and then again for the wedding of Zara Phillips in July of last year (seen below). 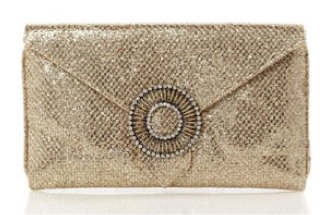 “brocade fabric with a subtle gold paisley trimmed with champagne colour net. Â It is long sleeved with a single breasted, off-centre, three button fastening. Â It also has two flap pockets. 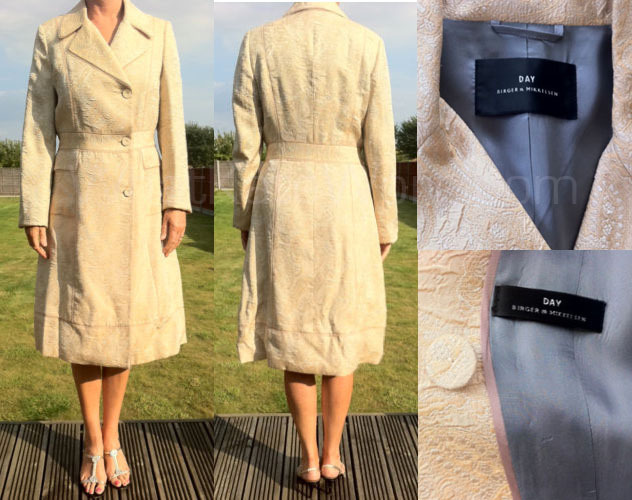 More on the coat may be seen in this post, below, an image from the eBay auction referenced above. Many will recognize the Birger name, designer Malene Birger co-founded Birger et Mikkelsen and now has her own line. 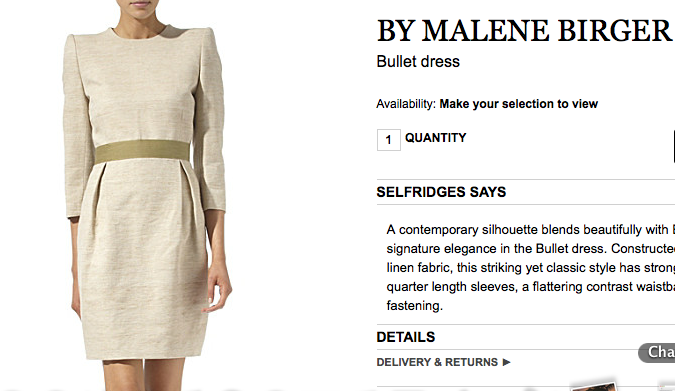 Kate has worn other piecesÂ by Ms. Birger, including her ‘Bullet” dress. Kate accessorized with her trusty LK Bennett Sledge 2 pumps, as well as a Wilbur and Gussie gold clutch, she carried it to the 100 Women in Hedge Funds dinner in October of last year (more here). 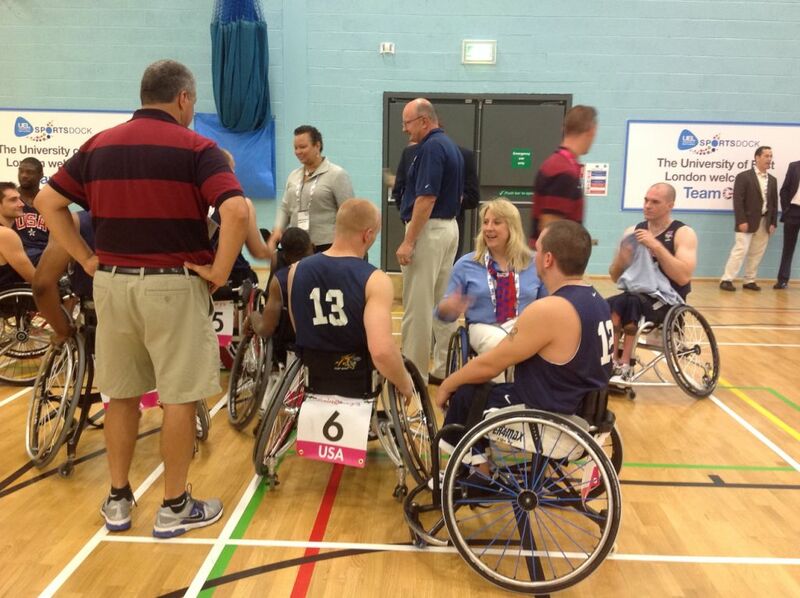 Activities have been underway for days, below we see the Team USA Basketball team. 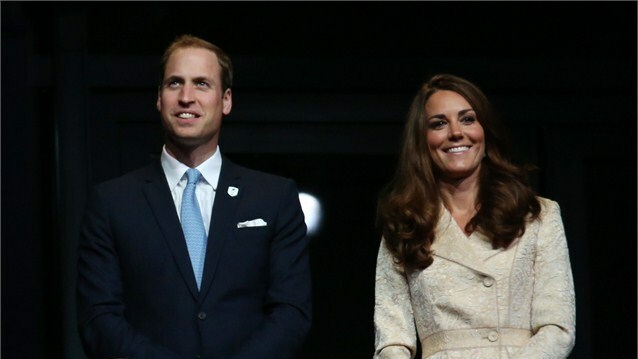 The Duke and Duchess of Cambridge and Prince Harry are provisionally scheduled to attend during the Paralympic Games. Their Royal Highnesses will attend in their capacity as Official Ambassadors for Paralympics GB.Â All engagements are provisional and subject to change at this stage. Attendance will be confirmed nearer the time of each scheduled event. William and Kate will attend Goalball (at the Olympic Park). William and Kate will attend the track cycling (at the Olympic Park). Kate will attend the swimming (at the Olympic Park). Â The Duchess of Cambridge will attend the Athletics (at the Olympic Stadium). Prince Harry will attend the swimming (at the Olympic Park). Prince Harry will visit Paralympics GB House. I like this coat. It can be dressed up or down. My only thought is that being brocade it can look like upholstery but then all brocades do sadly. Still, the style suits her and the Duchess looks elegant. Samantha Cameron looks good too. I saw that brocade is all over the fall runways—funny how the classics all come back around to being in style—the Duchess in on trend with a 6+ year old piece!! I was never crazy about this coat — I think it’s somewhat dowdy, and the fabric should be covering a sofa. I also didn’t much care for the Birger dress the Duchess wore in Canada. Though I like minimalist style and the Duchess clearly does, too, Birger just doesn’t address my personal tastes. However, I was interested to see the Duchess trotting out something that she’s worn not once but three or four times before. Smart move, especially since I understand that she’ll be unveiling about 30 new outfits on the upcoming Asia-Pacific trip. I applaud the duchess for wearing a multiple-times reworn dress to keep the attention on the athletes. My only real “gripe” about this entire outfit is that the waist needs to be tailored to assure a better fit. So excited to see what she will be wearing on tour! I’m intrigued with the mention that the Cambridges’ and Harry’s appearances at the Games might change. I wonder if this is in light of Harry’s recent scandal – they can pull him out of an event, blame it on scheduling goof or “prior commitment,” and move on. I don’t seem to recall seeing this mentioned before the Games last month, but maybe I didn’t see it. It’s interesting, is what I’m saying. This coat looks more second hand then recycled. It does not look fresh and does not fit her properly. I think she might feel nostalgic about this coat and has a hard time parting from it. Probably one of the first pieces she ever bought as a princess in waiting. Thank heavens for Kate and her sense of dignity — this coat-dress has to be the perfect “official function” outfit, combining the gorgeousness of the brocade fabric with simple elegance of style, plus a few tailored-seaming touches at waist and hem for interest. I can see where the “mumsy” tag is coming from, and I suppose the garment is a little bulky around the waist, but Kate’s sense of occasion is flawless and such a blessed relief from the recent unguarded antics of others among the royal fold. Being dressed up for an opening is ridicolous. Take SamCam and Sophie, they are minimal and elegant. Also patent leather (shoes), lace-brocade (coat), glitter (clutch… GLITTER??? OMG) pearls or diamonds (earrings)… this is not an outfit, this is just a minestrone! Sometimes i think she’s so “English” (it’s not a compliment). SamCam, as I recall, was the only woman at the royal wedding not to wear a hat or fasicnator. Sophie’s dress is just as “dressy” as Kate’s, and those tiny pearl earrings are far from blingy. Maybe at Royal Wedding SamCam, with her little headpiece and costume jewellery necklace, was sending a message, distancing herself from some aristocratic rules and a certain milieu… who knows. Getting to the point of the problem, the fabric of Sophie’s dress is simple and less precious, Kate’s coat is as “rich” as Queen’s one. A similarity, a signal? Who knows. If you feel the need to insult national groups, perhaps you could try to suppress it. I was insulting no one, it’s just style – not human dignity. Ask a French or Italian well-dressed but common woman for her opinion about Kate’s style and then let’s talk again. I think she chooses good pieces one by one but, when she matchs one with another, the result is a minestrone. It’s a tastful or tasteless affair. Bea, I lived in Italy, I speak fluent French and Italian (and German), I don’t need to ask Italian and French women what they think of the Duchess’s style. You went out of your way to make an unpleasant remark about the English. You admitted that it wasn’t a compliment. Why bother? Why be nasty on a site where we all try to be intelligently polite? @WKW admin: my last comment on the subject, i do not want to bore more. @Lili: if you lived in Italy (and you have an eye for style), you should understand that a non-compliment about style is not necessarily an insult or an unpleasant remark and, most of all, that “pearls+brocade+glitter+patent leather is a minestrone” is an opinion. Last but not least, “French women are the most elegant in the world” or “english women don’t know how to dress” are just labels for talking point or clichÃ©. Sometimes true clichÃ©, that’s all. Fabulous coverage, as always, Susan! I would just like to say that I am a great royalwatcher and read your blog regularly. It is a real quality publication. I like the way that in addition to featuring the fashions you describe and comment on the events themselves and provide links for further info and photos. Well done! Kate looks lovely. I love that she is recycling from as long ago as 2006 and 2007 (white skirt she wore a few weeks ago). 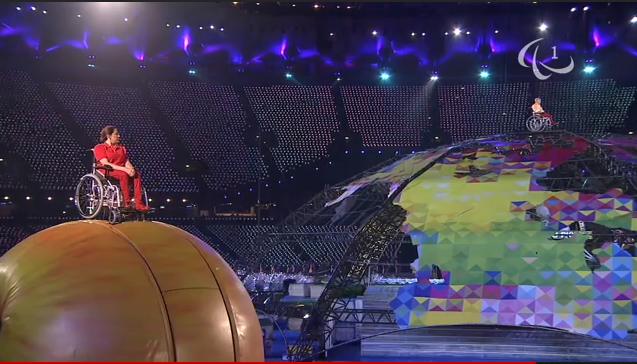 It is too bad that there will be so little television coverage in the U.S. for the Paralympic Games. Not my favourite piece of hers. A little mumsy and doesn’t show off her figure to its best advantage but despite that she looks stunning. The pale gold looks beautiful against her colouring. I completely agree – that coat color is lovely on our girl, but that’s one mumsy cut. As usual with her rare misfires, it isn’t a disaster but certainly isn’t the most flattering choice. On a happier note, Ms. WKW, thank you for featuring the Paralympics here. You do such an excellent job of covering the Duchess’s charitable endeavors in addition to the style stuff; we fangirls so appreciate it.